There were some mixed thoughts upon receiving the 2Handee. At first glance, it was very impressive to one, while another did not have a positive outlook. It is well packaged, displaying as much of the tool as possible. However, after opening and upon inspection, the 2Handee was more than it appeared to be in the package. The idea of having many tools in one is a delight. It has a non-slip grip for easier handling. How did the 2Handee perform? Should you hold on to your old tools or can you get rid of it all and replace with the 2Handee for all your fishing needs? There are many facets to the 2Handee fishing tool and some performed better than others. Ahh..Probably the most important tool every angler needs when they are fishing, a good set of clippers, because we all know that you have to be able to cut your line. These clippers worked well, but no better than some of the other products on the market. The claim is that these clippers can cut braided line. They were able to cut through 30lb mono and 60lb Fluorocarbon fishing line with little effort. At first use on braided it line, it proved to be more difficult. While some were able to cut the line, overall consensus is these clippers are inefficient for cutting braided fishing line. The rubber grip is definitely a nice attribute, making it more comfortable to use. The knife blade is concealed within the clippers of the 2Handee. The hilt of the blade is serrated and probably could cut through small tree branches. The knife blade is extremely sharp and can cut through the line the clippers could not. It did a fine job of trimming worms and jig skirts. 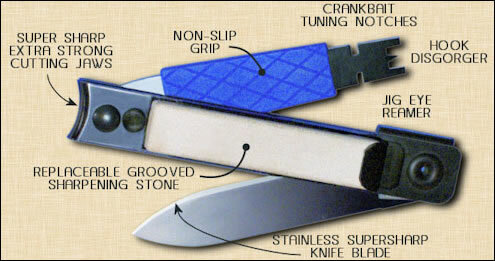 The knife blade proved itself over and over; it’s definitely a must have when fishing. The stone is one of the tool’s stronger points, although it is a bit awkward having that bulk in your hand. We tested a few worn down fishing hooks, such as crank-bait hooks, 3/0 worm hook, #6 Mustad hook, etc. It didn’t take much to sharpen, only a few passes, including back and forth motion. The stroked are sure and precise with an end result of a sharp hook ready to snag a bass. The sharpening stone is definitely a plus convenience wise. This feature wasn’t put to the ultimate test, but it did show promise and had some old lures running straight again. Although it’s not used that often, it is a nice feature to have, since you never really know when you might need it. One of the more annoying problems, and sure that many other bass anglers out there would agree with, is clearing out jig eyes. You’ll use just about anything you can find; a hook or tool clipper are the most commonly used tools. The 2Handee added the Jig Eye Reamer to help out and is another major strong point of the fisherman’s tool. This is something that really comes in handy and worked well and stood up to test. The 2Handee held up pretty well, but after some exposure to the elements has shown some signs of rust but nothing to stop the tool from working. While this is a well liked tool, there are some features the manufacturer missed. A set of scissors that could cut through braided line is a necessity, especially since it has become a very popular fishing line. It’s awkward at first with the stone attached and can make it a little challenging when using the clippers. It’s also a bit heavy, making it too cumbersome to carry on you. Adding a storage pouch would be an ideal solution. The 2Handee fisherman tool is a good buy and will most likely come in handy. The Troll Perfect is just that, Perfect!! Get control of your electric trolling motor! Whether fishing in wind, waves, current, or just whenever you need the high speed settings, Troll Perfect will allow you to stop fighting the kick back, and side to side torque steer of your trolling motor. You can concentrate on fishing (will also eliminate that “sloppy foot pedal” issue).